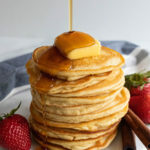 There are hundreds of keto-friendly pancake recipes out there. But only a few mimic the fluffy, cakey texture of traditional pancakes. This American classic is the perfect low-carb breakfast for lazy weekend mornings or even a weekday treat or dessert. While traditional pancakes may leave you in a blood sugar coma, these sugar-free pancakes will keep you satisfied for hours, and they taste just like the real thing. So, if you love pancakes, get your supplies and make this recipe immediately. Best served with a drizzle of keto syrup, Perfect Keto Nut Butter, or peanut butter. For a protein boost, try these protein-packed keto pancakes, complete with a scoop of whey protein powder. And for a dairy-free version, use coconut milk or almond milk in place of dairy milk, and coconut oil in place of butter. Using almond wheat flour in place of regular flour will naturally cut the carbs, but actually help balance your blood sugar. Almonds are a great source of magnesium, a mineral that can help with blood sugar and insulin control. In fact, when type 2 diabetics supplement with magnesium, they experience an improvement in insulin sensitivity and glucose control. In other words, they use more glucose as fuel so there’s not as much hanging around in the bloodstream[*]. By sweetening your pancakes with monk fruit, you may be giving your insulin sensitivity another boost. This sweet sugar replacement not only lowers the sugar content of your pancakes, but it may also enhance your bodies insulin secretion — shuttling more glucose out of your blood and into your cells for energy[*]. These easy keto pancakes are loaded with protein — 5 grams per pancake. Protein is well-known to be the most satiating macronutrient, so shifting the ratio of carbs to protein in this recipe means you get to feel full longer[*]. But that’s not the only way these pancakes keep you satisfied. There are countless ways that keeping your blood sugar balanced will help you reduce cravings and even lose weight. Your classic pancakes and maple syrup may satisfy your sweet tooth, but when it comes to blood sugar — what goes up must come down. That morning blood sugar rush is sure to leave you craving snacks later in the day. And unless you have heroic willpower, you’re destined for a blood sugar rollercoaster ride. Almonds can reduce your hunger and desire to eat, which means these almond flour pancakes won’t just leaving feeling satisfied — you won’t be hungry for hours[*]. Eggs may be the perfect breakfast food. They’re packed with protein, vitamins, antioxidants, and brain-boosting nutrients[*][*][*]. But sometimes you need a little sweet instead of savory in the morning, and who could blame you? Luckily, these delicious pancakes are a great way to incorporate eggs into your breakfast while also satisfying your sweet cravings. Gather your dry ingredients — coconut flour, almond flour, baking powder, and monk fruit — and mix together in a bowl. Add in eggs and milk and stir until all ingredients are smooth and blended. Coat a large non-stick skillet with butter or coconut oil, and place over medium heat. Slowly pour pancake batter on to the skillet and cook for 3-5 minutes. Delicious low-carb recipes like this one make following a keto diet easy and stress-free. If it’s your first time trying keto, you may be concerned about missing out on your favorite staples like pancakes and waffles, but keto recipes aren’t all meat and eggs. In fact, with the use of sugar-free sweeteners like monk fruit and stevia you can enjoy all kinds of foods without kicking yourself out of ketosis. So next time those pancake cravings hit, you don’t have to ditch your low-carb diet for regular pancakes. These are by far the best pancakes if you’re watching your carb count — full of flavor and devoid of sugar. Sugar-free, gluten-free, and low-carb — these are best keto pancakes for a low-carb or keto diet. Made with almond flour and coconut flour and topped with sugar-free syrup. Whisk all ingredients in a large bowl. Let sit for 5 minutes. Preheat a large nonstick skillet or pan under low-medium heat and coat with butter or nonstick spray. Pour ¼ cup portion of pancake batter onto pan and cook for 2-3 minutes on each side until golden brown. Serve with sugar-free maple syrup, butter, or coconut butter.